It's been cold on and off this month, so I haven't hurried to plant more things out, after some of the early plants suffered. But I did put in some beans - borlotti and French - and some sweet peas and sunflowers. I also sowed another row of radishes, we can never have too many radishes. The weeds have taken off. Last month the plot was under control, now weeds are trying their best to encroach into every bed. The asparagus has been particularly badly hit. It's hard to dig the weeds out without damaging the asparagus crowns. The turnips are doing nicely though, and we've had a huge bowl of artichoke hearts, as well as a bunch of asparagus two or three times a week. Pods are forming on the broad beans and the onions are swelling. There are two rows of beetroot growing well, one golden and one purple. I thinned them out and weeded them, and then watered them so that any disturbed roots didn't dry out. They don't seem to mind the chilly winds we've been having. The squashes and courgettes are rallying slightly after a dismal start. Alongside the shed, seemingly growing out of concrete, there's a lovely foxglove. Amazing how plants grow isn't it. Less good is the garlic. I'm not sure what's wrong with it, but it's looking very yellow. I did see a little rust on one of the plants, so maybe that's the problem. On the whole though things aren't looking too bad. There's lots of fruit on the blackcurrants and we picked a small bowl of gooseberries today. I'm almost out of space to plant things out, which probably means I need to stop sowing things. I still have peas, celeriacs, cucumbers and more French beans still to be squeezed in. There's never quite enough space is there? A few photos from yesterday morning. I've always been such a morning person. I wake up early and while I shower my head is usually full of ideas and energy and enthusiasm. If there's anything to be done that requires brain power or motivation, it has to be done in the morning. I like the early light and the peace. That quiet before the world gets busy. The garden still belongs to the birds. Their song is the only sound. The light is golden, filtered through more layers of atmosphere, making the greens a softer yellower version of themselves. I love to walk to school with the children. Some days I feel I could take on the world. It doesn't last of course, and not every day is like that, but if I am going to feel amazing, it's always in the morning. It's the best time to take a moment to enjoy the natural beauty of the world. The pale blue of a clear sky, the fresh purple of newly opened lilac blooms, the dewy white petals of that day's roses. The scent increases as the day goes on, but the beauty doesn't, the morning is the most beautiful time of day. While I think of the morning colours as cool ones, the light is warm. It's an intoxicating combination. The bird song is clearer and more heartfelt. The sunlight through leaves is mesmerising. There's a quiet magic in the morning that evaporates as the sun climbs higher. I heard an interview with Alexander McCall-Smith the other day. He'd just won the Bollinger Everyman Wodehouse prize for his comic novel, Fatty O'Leary's Dinner Party. The prize was a pig, and quite a substantial pig at that. You can see it here should you wish. I digress. In his interview he said that he gets up at 4 o'clock to write. 4 o'clock! It's a thought. And not entirely abhorrent to me. I've got up at 4 o'clock before now when I can't sleep. And I've worked in a job which didn't end until 4 o'clock or later. That didn't work so well for me. I like to do all of the things that require effort and forward momentum early. Late in the day is for kicking back and relaxing. Of course if I'm getting up at 4am I shall need a little siesta after lunch. Would that be allowed? A whole new way of life I think. Are you a morning person? Or a night owl? Do tell. Today I'm joining in with Annie Cholewa and listing a few happenings in my world at the moment. Looking forward to a week with no school. I know it will fly by, I hope we make the most of it. And I hope it's warm and sunny. Too much to ask? Hearing sedge warblers and reed warblers. They are at the wildfowl and wetlands place, and they're easier to hear than see. Me and the biggest boy have been listening to their songs on Youtube so that we know the difference. Smelling those stocks I put by the kitchen door. Fantastic. I shan't go a year without them again. Tasting some odd pale green/blue ball sweets that the littlest boy got in a party bag. Weird and foul. Who invents these ghastly things? Holding hands with my littlest boy. Oh he is so sweet and affectionate. The bigs don't hold my hand any more. I'm making the most of the one hand that will hold mine. Hugging the bigs though. They can't stop me. Talking all sorts of nonsense over the meal table. Oh how boys love to talk about ridiculous things. They make themselves laugh and laugh. It's infectious. Making a blanket. Yes I am. And I'm on the home straight of a quilt. Watch this space. Giving a little to the people of Nepal. I try to teach the children a bit about current affairs and try to explain what these people have lost. I'm not sure they can fathom the hugeness of it though. How could they? Gathering delicious young salad leaves from the garden. Lettuce, rocket and mine and the littlest boy's favourite, French sorrel. I must sow some more, it's in its second year and it's running to seed very quickly. We call it Lemony Leaves and we love it. Sometimes we even call it Lemony Snicket Leaves, see Nonsense above. Finding a little time to write. Just a little. I need to find more. Losing a bunch of library cards. Literally a bunch, they are on a key ring type thing. It wasn't me who lost them. I'm hoping they're here somewhere. Library cards are very important in this house. Sitting outside in the sun. Glorious. Standing at the park this afternoon fielding in a game of cricket. It's our new best thing. Walking tomorrow? Maybe, let's hope so. Or on bank holiday Monday. Nothing lifts my mood like a walk in the countryside, and at this time of year it's gorgeous. All of that cow parsley and fresh green leafage. Playing chess. That's our other new best thing. The middle boy has an electronic chess set that he plays if no-one wants a game. He's getting very tricksy and has beaten all of us at one time or another. Watching the fruit and vegetables swelling down at the allotment. Strawberries, gooseberries, blackcurrants, radishes, onions and artichokes. Noticing how the littlest boy copies the things I say about the gloriousness of the countryside, the loveliness of a sunset, the beauty of a garden. I hear myself in his sentences. I'm so glad he notices these things too. A lovely package came my way on Saturday. Emma at Silverpebble had a giveaway, which I won, and she sent me all of these pretty things. For those of you who aren't familiar with her blog, I can highly recommend a visit. Emma makes gorgeous silver jewellery, often inspired by nature, or with vintage finds or sea glass. The gorgeous necklace she sent me includes handcarved mother of pearl buttons made in the 19th century, a 1920s freshwater pearl and two tiny Roman beads made between 100 and 400 AD. Amazing. Needless to say I absolutely love it. She also sent me a vintage box full of treasures, Seaham seaglass, Caribbean shells and coral, and loads of packets of seeds. And a fantastic magazine about turning your hobby into a business. I absolutely love reading that kind of thing, hearing people's inspiring stories, and how they've created a business doing something they love. Thank you Emma, it was such a kind and thoughtful gift. It was a bit of a sad day here yesterday. Our dear piggie, Mrs Armitage, was put to sleep. She was quiet on Sunday, not really eating, and when I put her in her run she didn't spend much time out on the grass at all. I went up to see her first thing yesterday morning, and she had collapsed. I got the children to say goodbye to her, and then I told her it was time and scooped her up and we both went to the vets together. I came back on my own. I think I'm probably missing her most out of all of us. I always had half an eye on the weather so that I knew when it was good for her to go outside, and I always saved her the tastiest fresh tidbits. There's a guinea pig sized hole in my life. We've been gripped by a new sport. Cricket. It all started with a few lessons at school, then a free taster or two at the local club, and before I knew it I was signing up and buying strange things to put down pants. It's been an education I can tell you. We happened to be passing the club today, so we popped in to see how it's done by the big boys. Of course it's all pretty much a mystery to me. There was clapping and cheering and it was in no way apparent why. But the sun was shining and there was tea later on (I've heard rumours of sandwiches with the crusts cut off and scones with jam and cream) and I saw the potential for an afternoon sat knitting and thinking, with just the occasional smattering of light applause required, and I had a bit of a lightbulb moment. This may just be a sport I can get behind. 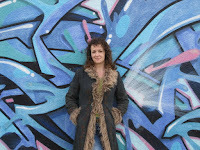 My friend Sara at Sara's Crafts very kindly nominated me as one of the two blogs she chose as "Two Good Reads". It's always lovely to be mentioned, thanks Sara. In turn I'd like to point you in the direction of Countryside Tales if I may. Her latest post explains the dangers wildlife is facing as the government and the European Commission explore watering down the legislation currently in place to protect it. CT's blog is full of fantastic butterfly and moth photos, as well as other wildlife, and her posts are always interesting and informative. Truly one of my favourite blogs, and very well worth a visit. There is a petition, organised by Friends of the Earth, that you can add your name to here should you wish. Protection of our native wildlife is something I feel passionate about. It will be a disaster if the legal protection is weakened. The caterpillar and the chrysalis in the pictures are in the garden at the moment. The chrysalis suddenly appeared on the path. I think it's an elephant hawk moth that probably fell out of the hedge. I've put him somewhere safe and hopefully he'll hatch (if that's the right word) and fly off. We had three or four elephant hawk moth caterpillars in the garden last year, they're really enormous. I'd love to see the actual moth. Fingers crossed I'll have the opportunity. The yarn is a little something I'm working up to knitting for the littlest boy. A blanket for his bed. He's very keen, as you can imagine. I'm thinking grey, with little stripes of colour. It seems slightly unfair that girls have hijacked an entire colour all for themselves. He's not adverse to the odd splash of pink. We shall see. I don't have a huge amount of time for knitting, so it'll probably be a year or two before it's done. By then he might have been poisoned against pink. Today was a good weekend day, with a little garden tidying this morning, and some time at the country park this afternoon. It always surprises me how organised a bit of gardening makes me feel. I repotted a wisteria, mowed the grass (and daisies), planted some peas and salad leaves and swept up. And then all was well with the world. I'm wishing you a good Sunday. Every time I go out at the moment I'm blown away by the very greenness of everything. I love July and August with their summer heat and holidays and harvests, but right now is the time of year when I just have the word "glorious" in my mind all the time. After the bare branches of winter, suddenly everything looks different. Thick heavy green, everywhere. I've always forgotten what it looks like by spring. Every year it's a surprise. When we drive along country roads I exclaim about it constantly. I'm not sure anyone else here gets it. Look at the horse chestnut flowers. Aren't they extraordinary? And the trees are majestic. Not English natives, but our landscape has adopted them and they thrive here. 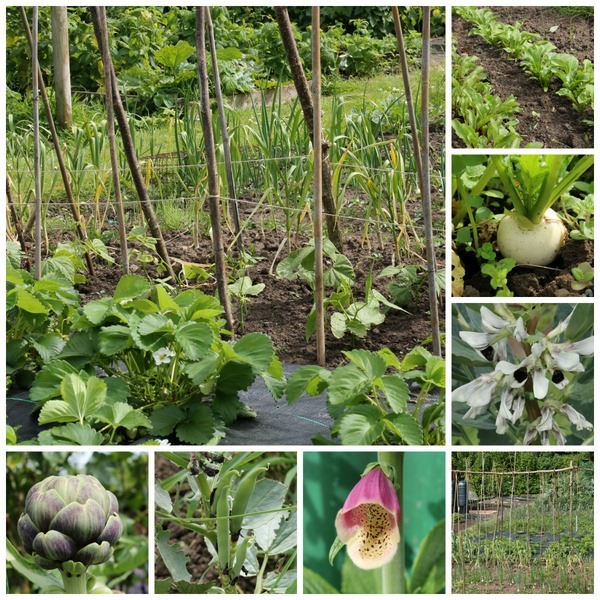 I went to the allotment this morning because the forecast was for sun all day. Tomorrow's is for rain all day. Today was gorgeous, like summer, but I'll love the rain tomorrow as well. The chance to stay in and listen to the rain drumming on the windows. And of course all my watering will be done. The asparagus has been doing well, and there was a big pot of radishes to bring home. Blackcurrants and gooseberries are swelling, and happily the two new apple trees are flowering at the same time, which means they should pollinate each other. There are masses of flowers on the broad beans and the strawberries are looking a bit cheerier than they were. They struggled slightly with the weedproof membrane, some of their leaves and berries went out horizontally underneath the fabric rather than out the top. I've pulled them out and pegged it down a bit more. The garden shop on the high street had stocks on offer when I went in earlier. The scent is fabulous. I picked up three and put them in a pot together by the back door. Forgot to photograph them, I'll do it another day. Hopefully the scent will waft into the kitchen a bit. It smells like the summer days of my childhood. Hardly any photos recently, I'll try harder this week. I found the Polling Station one on my little camera, from the school run on Thursday. So that was a dramatic day or two, no? The weekend here was dominated by a football tournament. Starting with helping out at 8am on Saturday. The biggest boy played all Saturday morning. I spent three hours at lunchtime helping in the barbecue tent, and managed to miss most of his matches and most of the middle boy's matches in the afternoon as well. The washing machine died in spectacular fashion. Then the middle boy was sick on Saturday night. I spent today hand washing things, while the other half took the littlest boy back to the tournament for his matches. The biggest boy was charged with taking photos of any goals or monumental moments. He got quite a few decent shots, but the lens wandered skywards a little as well and I found a few bird pictures sprinkled in the mix. And one with just a knee. The matches were five minutes each way, with a vast amount of hanging around in between. The teams weren't very well put together and no-one really enjoyed it very much. Quite a few of the parents who were supposed to help out just didn't bother turning up. I'm tempted to say never again. Anyway, I'm happy to put those two days behind me. Next time I think we'd all be happier giving it a miss and going for a walk in the depths of the countryside. Sometimes it's just nice to be together relaxing, rather than doing scheduled things. We barely ate a meal all together. It's good to get to the end of a weekend with a warm glow of good things to carry into the new week. I'm hoping you had the warm glowy kind of weekend, rather than the teeth grinding kind. But whichever it was I'm wishing you a good week.